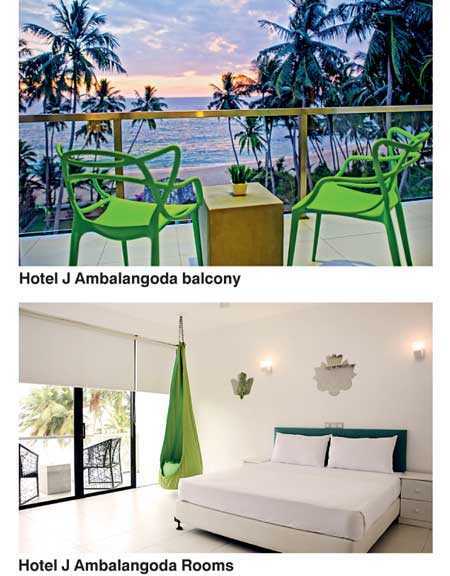 If a weekend getaway with unparalleled views, gourmet delights, peace and privacy is on your bucket list, but you are a budget-savvy traveller, Hotel J Ambalangoda is your escape from reality! The hotel creates a perfect balance between quirky and sophisticated, with a tropical designer ambience to remind you exactly where you are – paradise! The newest addition to the Hotel J brand, located 15km from the bustling Hikkaduwa town, offers one modern dorm room with 10 beds for lodging and 21 double rooms for those seeking more privacy. Fifteen out of the 21 rooms offer breathtaking views of the Indian Ocean. All double rooms include private balconies, air conditioning, electric power, telephone with IDD facility, bathroom with rain shower enclosure with hot and cold water, TV, free Wi-Fi, fan, safe-deposit box, and toiletries. Ultimate relaxation and rejuvenation is guaranteed with high importance placed on the quality of mattress, superior bed linen and pillows for a perfect night’s sleep. Dining atCafé J, the brand’s signature restaurant,is an experience in itself as the well curated menu includes local and international flair with a creative, modern twist. Start your day with a smoky Shakshuka or fluffy pancakes with butter-crisped edges served with house-made salted caramel sauce or treacle. A beach holiday is not complete without savouring in the freshest local seafood. Tantalise your taste buds with sirloin steaks grilled with thyme butter or a crispy battered fresh Mahi Mahi. When you are on holiday, indulging in your favourite carbs is acceptable. At Café J, traditional dishes are spiked with exotic local flavours, from Spaghetti carbonara with a hint of Sri Lankan peppers to curry leaf infused crusted chicken burger served with homemade sweet potato fries will make you wonder if you are actually holidaying on a budget. Lounge by the pool or wander down to the pristine beach and take a dip or listen to the soothing sounds of the waves. Hotel J is an ideal destination for solo travellers who are keen to meet and socialise with other guests. Those interested in arts and culture, can organise a visit to the Ambalangoda Mask museum or participate in a lesson on mask carving and lace making followed by the Bawa trail – to explore Geoffrey Bawa’s Lunuganga and Bevis Bawa’s Brief Garden. The more energetic will have the opportunity to sign up for water sports activities in Bentota or whale watching and surfing in Mirissa. For more information contact +94 114 709 400 or email reservations@hotelj.lk or log on to www.hotelj.lk.